Thyroiditis refers to a group of disorders that cause inflammation of the thyroid. Your thyroid is the gland located in the front of your neck below your Adam’s apple. The thyroid makes hormones that control your metabolism and affect how your body works. Metabolism is how your body processes substances to produce energy, or burn calories. The cause is antibodies that attack the thyroid. Symptoms are those of hypothyroidism. Hypothyroidism is permanent, but can be treated. The possible cause is a viral infection. Symptoms include pain in the thyroid and those of hyperthyroidism, followed by hypothyroidism. Symptoms improve within a few months. Hypothyroidism is rarely permanent, but can be treated. The cause isbacteria or infection. Symptoms include pain in the thyroid, mild illness, and those of hypothyroidism. Symptoms improve after treatment of the infectious cause. The cause may be antibodies that attack the thyroid or an autoimmune disorder. Symptoms are those of hyperthyroidism, followed by hypothyroidism. Symptoms improve within 12 to 18 months. Hypothyroidism may be permanent, but can be treated. The cause is antibodies that attack the thyroid after delivery of a child. Symptoms of hyperthyroidism appear 1 to 3 months after delivery. Symptoms of hypothyroidism begin about 4 to 8 months after delivery. The cause is use of radioactive iodine for treatment of hyperthyroidism or radiation therapy for treatment of certain cancers. Hyperthyroidism may get better but then come back. Hypothyroidism often is permanent, but can be treated. The cause isthe use of prescription drugs, such as amiodarone, lithium, interferons, and cytokines. Symptoms are those ofhyperthyroidism or hypothyroidism. Symptoms continue as long as the drug is taken. Thyroiditis symptoms vary since it is a group of disorders with several types. tremors (shaking hands or fingers). People who have thyroiditis also may have pain and swelling in the thyroid gland (in the front of the neck). The cause of thyroiditis depends on the type of disease you have. Most types occur when your immune system attacks the thyroid gland. This causes inflammation (the body’s response to injury) and damages the thyroid cells. The reason for the attack often is an autoimmune disease, such as Hashimoto’s. Other types of thyroiditis occur from use of radiation or certain medicines. Viral or bacterial infections also may cause thyroiditis. Lab tests often can diagnose thyroiditis, including what type you have. Your doctor will start with a blood test. This measures the amount of thyroid hormone in your blood. It will show if your hormone levels are too high or too low. Blood tests check your level of thyroid-stimulating hormone (TSH) as well. TSH is produced in the pituitary gland and can affect your thyroid hormone levels. Blood tests also can show if you have antibodies present in your body. Your doctor may do a radioactive iodine uptake test. This measures your thyroid’s ability to absorb iodine, a mineral that is needed to produce thyroid hormone. In some cases, you may need a biopsy to determine what is attacking the thyroid. Can thyroiditis be prevented or avoided? Most cases of thyroiditis cannot be prevented. If you have a health issue that requires treatment using radioactive iodine or radiation therapy, talk to your doctor about your risk of thyroiditis. You may be able to start with other treatments to avoid your chance of thyroiditis. If you take prescription drugs that can cause thyroiditis, talk to your doctor about your risk and if you can stop taking them. You still may not be able to avoid thyroiditis. Treatment for thyroiditis depends on your type and what symptoms you have. If you have symptoms of hyperthyroidism, your doctor may prescribe a medicine called a beta blocker. This helps to lower your heart rate and reduce tremors. Since hyperthyroidism often is temporary, your doctor likely will taper the dose of this medicine as your symptoms improve. If you have symptoms of hypothyroidism, your doctor may prescribe thyroid hormone replacements. These help to restore your body’s hormone levels and get your metabolism back to normal. It can take several tries to get the right dose of synthetic thyroid hormone. Your doctor may taper the dose of this drug over time as your symptoms improve. Talk to your doctor if you have pain in your thyroid. They may recommend a mild anti-inflammatory, such as aspirin or ibuprofen to manage the pain. Severe thyroid pain may require treatment with steroid therapy. Thyroiditis and its symptoms may be temporary. In this case, you will be able to live a normal life following treatment. If the condition returns or is permanent, work with your doctor to manage symptoms. If you do not get treatment, damage to your thyroid may continue and could lead to more health issues. For women, you may have problems with fertility or your children could be born with birth defects. What type of thyroiditis do I have? 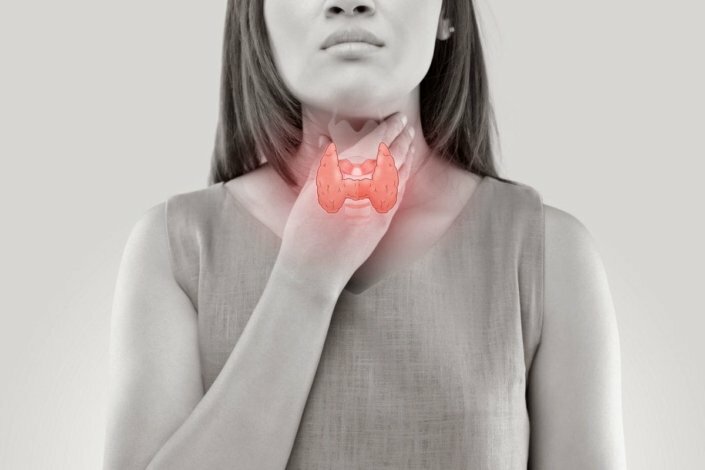 What is the likely cause of my thyroiditis? Are there any lifestyle or diet changes I can make to manage symptoms? What is my risk of long-term health problems?